Don’t get stuck on a warm day without something cold to keep everyone cool. You supply the ice and we supply you with three individual quarts of flavoring to meet everyone’s tastes – Quick and easy to do, just pour in the ice, push the button to shave and serve up the coolest treat at any party. Our Snow Cone machine rentals sell out like hot-cakes during the hot summer days! If you are starting to plan your family get-together, picnic, or festival, we highly suggest you book your Snow Cone machine early! This machine will bring cool and refreshing treats on those blazing hot summer Louisiana days! 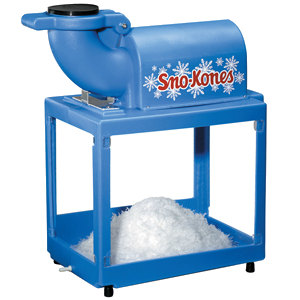 Our Snow Cone machine rental comes with the machine itself, the Snow Cone scoop, 40 paper cones and one bottle of syrup. We ask the customer to provide a hard surface set-up such as a counter-top or table as well as the recommended 40lbs of ice for the 100 servings. Last but not least, we do ask the customer to provide full supervision for the duration of the event. All that the customer has to do is plug the snow cone machine into a 20amp electrical circuit within 5ft of the machine and pour the ice into the spout and pull down on the lever until “snow” is made! Easy as 1,2,3! All that is left to do is pour the flavored syrup over the ice and enjoy!